Spring has been slow in coming here in Kentucky. We had a few beautiful days before the temperatures plummeted again to snow-like temperatures. 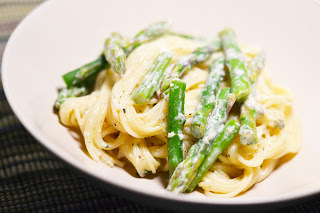 Regardless, asparagus is coming into season, and partly because I look forward to this time every year and partly because I was desperate to force a little spring into our lives, I bought two pounds of asparagus last weekend. I usually just oven roast it with a little olive oil, but I wanted something a little sunnier. 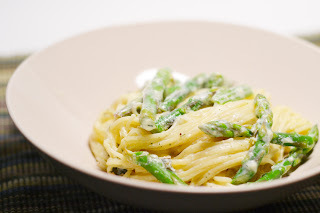 I opted for this Lemon, Dill and Asparagus Pasta. I never thought dill and asparagus would go well together, but this was a bright, flavorful and quick dinner--it took longer for the water to boil than it did to actually cook the dish. And when asparagus is out of season? I'll be substituting green beans. This is seasonal cooking at its best. Put water on to boil in a large pot. While you are waiting for it to boil, prepare your other ingredients--this comes together pretty quickly once you start cooking. Cook the pasta in the boiling water for 4 minutes. Add the asparagus and cook for two more minutes. Drain and set aside if the other vegetables aren't ready yet. While the pasta cooks, melt the butter in a large frying pan over medium heat. Add the green onions, lemon peel and garlic and saute for one minute. Add the lemon juice and cook until the lemon juice is almost evaporated, about two more minutes. Turn the heat down to very low. Beat together the eggs and milk with a whisk. Add the pasta and asparagus to the pan along with the milk mixture. Cook over low heat until it becomes slightly thick, about two to four minutes. Do not boil. Stir in dill, salt, nutmeg and pepper. Serve immediately. I like that you used milk instead of cream. Was it still rich enough? It seemed rich enough to me, but I wasn't looking for richness. I was more interested in a light lemony flavor. It didn't really create much of a sauce--it mostly just clung to the noodles. If you wanted more of a rich sauce, you could use cream (and a little more than called for). I absolutely love the sound of this spring pasta. It's going on the meal plan for next week. Congrats on the new site, Mindy - it looks great! I love this kind of pasta! Gourmet and simple at the same time...love the new look of your blog! شركة نقل عفش بالخبر اهلا ومرحبا بالسادة عملاء الدمام في شركاتنا الشركة العربية نحن افضل شركة نقل عفش بالدمام يسرها ان تقوم بتقديم خدمات مختلفة فى نقل العفش والاثاث بالدمام، نقوم بالنقل بشكل ءامن وسريع الجودة اساس اعملنا فى نقل الاثاث من والى اى مكان داخل او خارج الدمام فقط اتصل بنا نحن افضل شركات نقل الاثاث بالدمام . [URL="http://www.alarabia-dammam.com/"]شركة نقل عفش بالخبر[/URL] عزيزي العميل من الضرورى ان تكون شركة نقل الاثاث التي تعمل في هذا المجال لديها من الدقة والاتقان ما يجعلها تعطي للعميل خدمة ممتازة وبجودة عالية حتى بالفعل تكون موضع اختياره دائماً ومن الدقة التي تطبقها شركة نقل اثاث بالخبر ان فريق العمل يقوم بالفهرسة الدقيقة للاثاث حيث يتم ترقيم الصناديق والكراتين وقطع الاثاث حتى يتم تركيبها مرة اخرى بكل سهولة وحتى لا يتم تداخل اثاث اي عميل مع الاخر, وحتى يتم العثور عليها بسهولة وهي داخل المخزن, كما ان العميل يأخذ نسخة من هذه الفهرسة.